This article is about a woman who turns her two-year-old daughter's drawings into beautiful pieces of art. 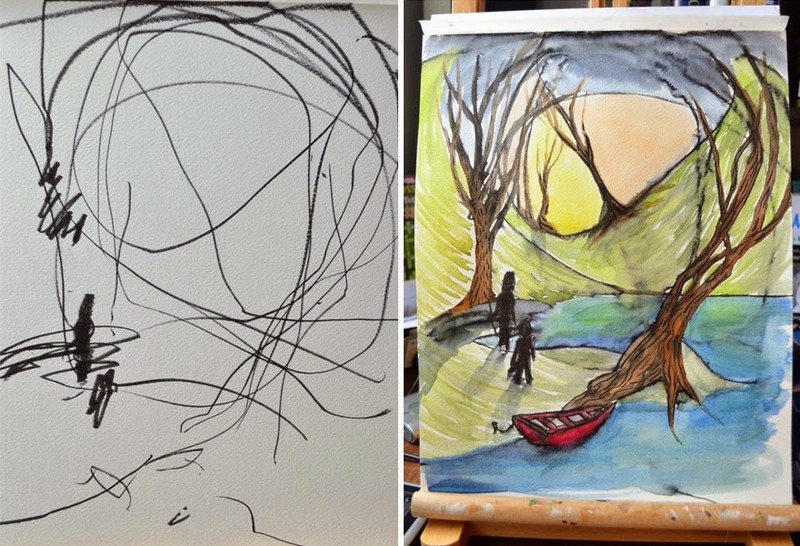 Looking over the pictures, I was absolutely blown away by the art she found in her daughter's scribbles. It made me think of God turning our broken lives into something beautiful. You may look at yourself and see a bunch of scribbles, mistakes that cannot be erased, but God looks at you and sees a beautiful piece of art. He is using each line, every choice you've ever made, to shape you into who He made you to be. "You are a masterpiece that grows closer to completion every day. You cannot expect to be finished overnight, and you cannot allow yourself to become discouraged when you don’t progress as fast as you think you should. The Artist loves to watch every stroke of His brush add another dimension of depth and beauty, bringing you closer and closer to His perfect vision. When the portrait of your life is complete, He will unlock the canvas from its easel, and hold it up: “Beloved, you are mine.” And with that, He will add the finishing touch: His signature- written in His blood. He will walk over to His wall and hang it up to admire its beauty and perfection. At that moment, you will be standing there with Him, having finally realized that your entire life on earth was merely preparation for this moment, and the eternity to follow."